Monitoring and Evaluation of Biomaterials and Their Performance In Vivo provides essential information for scientists and researchers who need to assess and evaluate performance, monitor biological responses, gauge efficacy, and observe changes over time. Crucially, it also enables the optimization of design for future biomaterials and implants. 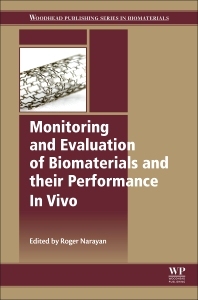 This book presents readers with comprehensive coverage of the topic of in vivo monitoring of medical implants and biomaterials. Dr. Roger Narayan is a Professor in the Joint Department of Biomedical Engineering at the University of North Carolina and North Carolina State University. He is an author of more than 100 publications as well as several book chapters on nanostructured biomedical materials. Dr. Narayan has received several honors for his research activities, including the NCSU Alcoa Foundation Engineering Research Achievement Award, the NCSU Sigma Xi Faculty Research Award, the University of North Carolina Jefferson-Pilot Fellowship in Academic Medicine, the University of North Carolina Junior Faculty Development Award, the National Science Faculty Early Career Development Award, the Office of Naval Research Young Investigator Award, and the American Ceramic Society Richard M. Fulrath Award. He has been elected as Fellow of the American Ceramic Society, the American Association for the Advancement of Science, the American Institute for Medical & Biological Engineering, and ASM International.